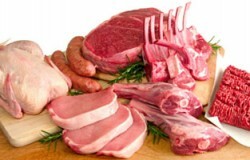 how do i market my meat products? "Mom, I am headed home now." "I'm in the Volvo not the Trans Am." Hmm. You are probably thinking, "What does this have to do with marketing?" Well, a lot. Your marketing strategy should have a target audience, and not the shotgun approach. You need to brand your product. Volvo has branded themselves as a safe, family car. They may be trying to change the image to be sportier, but it's a tough job. Think about Scotch tape or Kleenex, brands with so much recognition they are household names. These are national examples, so bring it down to the local level. Develop your own marketing strategy. Your farm enterprise should be treated like a business. And, like it or not, you need to be a salesman. You will need to toot your own horn. The big question: What sets you apart from the rest of the producers of your product? What claims will your customer care about the most? To market your product strategically, pick a target customer. That doesn't mean eliminate everyone else along the way; it means your marketing will have a focus. At a recent Strategic Livestock Marketing Workshop 3 types of customers were described: Foodie/locavore enthusiasts; health /social cause-motivated; traditional/value shopper. There's other types, but keep it simple, they are the focus. Foodie/locavore enthusiasts - these food buyers want the best of the best, those premium cuts. These customers are least price sensitive but may not be loyal shoppers. Health /social cause-motivated â?? these buyers are moderately price sensitive. They will shop at farmer's markets, CSAs or freezer trade. They will be moderately loyal with their purchases. Traditional/value shopper - these are the smart shoppers who shop around and then buy in bulk. They are the most price-sensitive and most loyal. How will I better my position in the marketplace? How will I carve out my spot? How will I gain customers? How will I increase sales? Keep your message clear and focused for your targeted customer. How do you want to be known? Develop a logo for your enterprise and use it on all marketing material - business cards, brochures, and website. This is a brief overview. I always tell prospective livestock producers to think about the end before they begin. If you'd like to learn more about marketing, let me know and will put together some fall and winter workshops!